Disruptor Beam is a relatively young development studio based in Boston, MA. Nonetheless, the company is dealing with something of a mammoth IP on tablets and PC. I met with Jon Radoff, the CEO of the company, and Rich Gallup, executive producer, to chat about Game of Thrones Ascent, which they were showing off at PAX East 2014. SPOnG: Tell us about Game of Thrones Ascent. Jon Radoff (JR): The core premise is that Game of Thrones Ascent is not about killing off the bad guy, as there are a lot of bad guys in that realm. In Game of Thrones Ascent the player takes on the role of a lord in Westeros and they swear fealty to one of the major families like the Starks or the Lannisters or even the Targaryens. The player has their own ambitions and you also have ambitions that support your major house. So the player is going to make decisions about whether you're going to be truthful or cunning, whether you're going to support your family vs. the realm, whether you for the old gods vs. the new. We have a real story driven system, which is represented in Game of Thrones Ascent by a series of menu choices that the player can make. The decisions made affect the storyline in a similar way to a Bioware game such as Knights of the Old Republic, Mass Effect or Dragon Age we draw upon similar storytelling elements where there is branching and things that affect the player's alignment within the game. In fact, a lot of our writers come from Bioware - hence these mechanics are prevalent in Game of Thrones Ascent. So story is the core thing that drives Game of Thrones Ascent, but players are also encouraged to develop their territory or holdings. SPOnG: Where is Game of Thrones Ascent based? Is it primarily Westeros? JR: Game of Thrones Ascent is set in any part of Westeros, so you can be building in the North and you can go all the way down to Dorne, where the Martells are. With Game of Thrones Ascent being a multiplayer game, there are about 100,000 people are playing a day. All of the diplomacy and politics that players go through initially are not interacting with other players. But quickly they get enmeshed with alliances or participating in what we call an alliance war. These happen every month, where players are vying for supremacy over all the other territories of Westeros. Rich Gallup (RG): Further to that we have a Power Leader Board, which is where players can check to see where they are standing amongst all of the other lords that are playing Game of Thrones Ascent. So as we're talking the lord we are controlling is the 539,154th most powerful in Westeros. Basically, every single thing the player does in Game of Thrones Ascent influences their power. My favourite part of Game of Thrones Ascent is the quest system, which has an extensive tutorial. 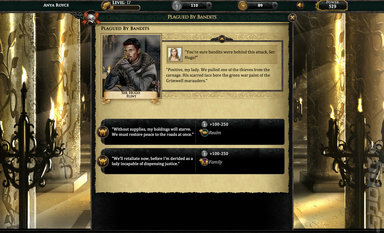 As quests are completed, the characters that the player (as a lord) sent to complete them ask favours. How the player grants these favours affects their lord's alignment. Alignments unlock additional content for the player. For example if you favour being 'truthful' and max that out to 100% the player gets a new title, which is 'The Sincere'. 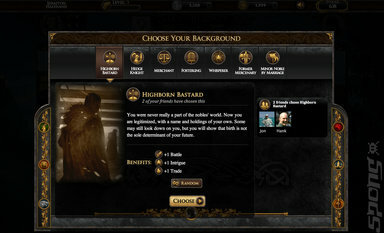 This allows players to create their own character that fits how they want to fit into the world of Westeros. SPOnG: Looking at the striking interface to Game of Thrones Ascent, it's akin to a choose-your-own-adventure-like game. Is that an accurate description? RG: It is kind of like that. Basically the challenge of doing any choose-your-own-adventure game like this is the amount of content required to be created. So there are branching quests yes, but very often those branching quests will come back to the main narrative. Sometimes they are a little bit more involved and let the player go off in a tangent. 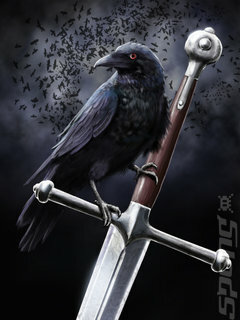 Leading from that there is a role playing aspect to Game of Thrones Ascent. This is centred around a 'Lore Book', which players can refer to when trying to determine where they are in the story and their background. This is pulled from well-known characters in the Game of Thrones universe.